Dan Pfeiffer is the White House spokesman, which means he doesn’t say anything without the POS’s approval. 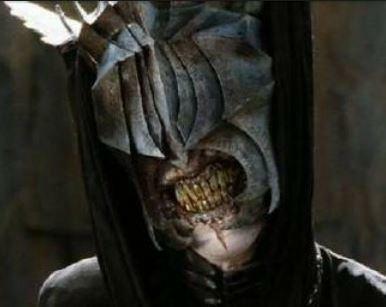 In effect, to borrow a character from JRR Tolkien’s Lord of the Rings, Dan Pfeiffer is the Mouth of Sauron. Yesterday, I did a post on Edie Sundby, the California woman who has Stage 4 gallbladder cancer and will lose her excellent healthcare plan because of Obamacare — because her UnitedHealth plan does not meet the “standards” of Obamacare. 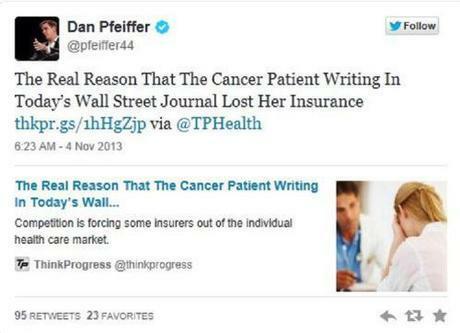 Melissa Cline for Newsmax, Nov. 5, 2013, that Twitter lit up over White House spokesman Dan Pfeiffer’s statement blaming a Stage 4 cancer patient and insurance companies — instead of the president’s signature legislation — for the woman losing the coverage that has kept her alive [for 7 years] despite a dire prognosis. Pfeiffer’s is an official Twitter account, used to speak on behalf of the administration. His account was besieged with responses. Angry tweeters retweeted the responses of others, starting a firestorm in cyberspace. “Obamacare disaster: Health insurances cancelling policies of hundreds of thousands,” Oct. 22, 2013. “Elderly Americans in a panic over losing doctors because of Obamacare,” Oct. 25, 2013. “Top U.S. hospitals are opting out of Obamacare,” Nov. 1, 2013. I wonder how many of those who are discovering their health insurances have or will be cancelled and who have lost the doctors they trust, had voted for the POS. More importantly, what are they gonna do about it? If These Don’t Make You Smile, Your Smiler Must Be Broken!